So Assassin's Creed Origins isn't even out yet - definitely not counting the days until the end of the month - but Ubisoft has revealed some exciting expansion news. While there's some intriguing DLC on the way via two big story packs next year, 2017's free content is looking ridiculously good fun. 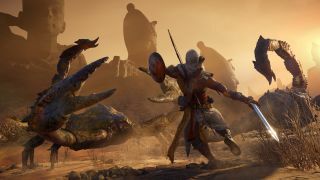 Fancy pitting Bayek against Egyptian Gods and mythical creatures? Yeah, thought so. The Trials of the Gods event is kicking off 15 days after launch on October 27, and means huge boss battles against the biggest names in Egyptian hieroglyphs. Make no myth-takes, thanks to a glitch in the Animus, these monsters will be very real for Bayek and nightmarishly difficult. Good thing we'll get exclusive loot for our troubles. Also revealed as part of the free launch and post launch content loot drop is the Nomad's Bazaar, a wandering merchant who'll hand out quests for exotic loot, as well as a horde mode for the Gladiator arena, and, most importantly, a photo mode. As someone who has drooled over the vistas and individual sand grains since E3, take it from me, you're going to need some serious space on your hard drive. Your poor Twitter followers aren't going to know what's hit them. The Nomad's Bazaar and Photo Mode will be in the game from launch but you'll have plenty of time to prepare for the horde mode which isn't rushing in your direction with deadly weaponry until 2018. Plus, if you've already pre-ordered the Gold Edition or are planning on investing in the season pass, next year's DLC packs look like satisfying additions rather than a few cursory hours. The Hidden Ones, out in January, continues the story of the Brotherhood and moves the action to years later as Bayek clashes with an occupying Roman force. This will open up a new region and also up the level cap which we currently know is sitting at 40. Assassin's Creed Origins is out on October 27. If you're looking for more Ancient Egyptian info, check out our 11 cool things we discovered in 8 hours of Assassin's Creed Origins.